A sub-national polio vaccination campaign in selected 97 high-risk districts started on Monday to vaccinate over 20 million children. According to an official of the National Emergency Operations Centre for the Polio Programme, during this special campaign, frontline polio workers will go door to door to ensure children are vaccinated with two drops of vaccine to protect them against the poliovirus. 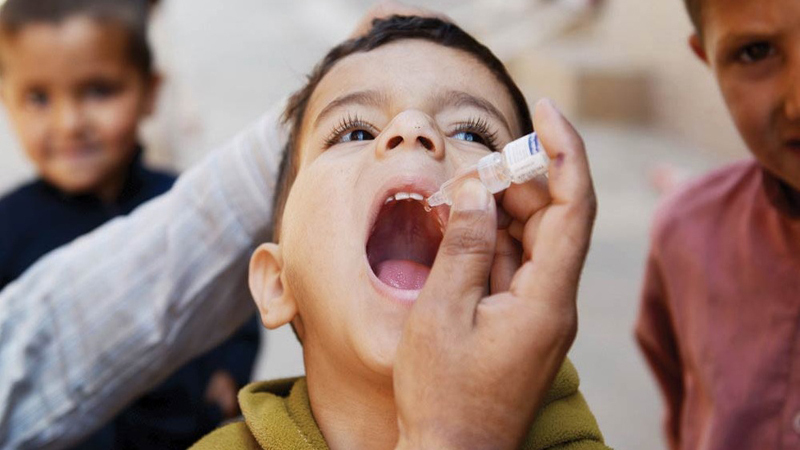 Since the beginning of the year, six polio cases of wild poliovirus have been detected in the country, which included cases from Karachi city, Lahore city, and districts like Bajaur, Khyber, Hangu, and Bannu in Khyber Pakhtunkhwa, he added. He said that considering the present risks due to poliovirus circulation, the government has urged the parents to ensure immunization of all children during each and every polio campaign. He said that during this vaccination campaign, a total of 5.59 million children below the age of five years will be administrated the vaccine in 25 districts in Khyber Pakhtunkhwa, including seven tribal districts. In Sindh, the polio campaign will run in all towns of Karachi and in 20 districts of interior Sindh, where over 6.13 million children under five years of age will be administered polio vaccine, he said. In Punjab, the polio campaign will be administered in 12 districts, where more than 6.6 million children will be administered the polio vaccine, he added. Similarly in Balochistan, the vaccination activity will be launched in 21 districts, where approximately 1.77 million children will be given polio drops, he said, and added that Islamabad will be implementing polio campaign in all high-risk areas targeting 0.24 million children under five years of age. Coordinator of the National Emergency Operations Centre for the Polio Programme Dr Rana Safdar stressed the importance of civil society, religious scholars and media in promoting the norm of vaccination. “Parents should cooperate with polio workers and administer their children with anti-polio drops, which will ultimately help save them from a lifetime of disability,” he said, and explained that polio is caused by the poliovirus and the affected children can be paralyzed for life. He said there is no cure for polio, but prevention through immunization can reduce the chances of contracting the virus. He added multiple vaccinations are critical in safeguarding children from the virus. “Challenges remain in fully eradicating the virus, however the federal and provincial governments stay firmly committed to defeating the virus forever,” he said, and expressed the hope that all segments of society will come forward to support the programme during the final push against polio. He said that polio is a highly infectious disease caused by poliovirus mainly affecting children under the age of 10 years. He said the disease invades the nervous system and can cause paralysis or even death. While there is no cure for polio, vaccination is the most effective way to protect children from this crippling disease, he explained. He said that each time a child under the age of five is vaccinated, his protection against the virus is increased. Repeated immunizations have protected millions of children from polio, allowing almost all countries in the world to become polio free, he added.